Fall is officially here! I am loving the crisper air and cooler weather. We celebrated with having friends over for brunch this weekend and started our meal with these. Warm whole wheat scones with cinnamon pear and apple butter. This butter is healthy and delicious on pancakes, toast, or fall grilled cheese. The scones are simple and basic but could be jazzed up with fresh fruit or cranberries. It was my first time using a food processor to make dough and I can’t believe how easy it was. Why have I not been doing this sooner? Anyways, I will be making a lot more breads now! In a food processor, stand mixer or large bowl combine the baking powder, flour, salt, sugar, and cinnamon. Pulse or stir a few times to combine. Add the shortening and pulse a few times until the butter is combined throughout the dough in small pieces. Alternatively, you can cut the butter into the dough until little pebbles of dough and butter have formed. Add the milk and stir/mix until just combined. Turn out onto a lightly floured surface and knead a few times to incorporate all of the flour. Roll out the dough into a large circle, about 3/4″ thick. Slice into 8 pie pieces and place onto a baking sheet. Bake at 400 degrees F for 15 minutes until golden brown. Core and chop the apples and pears. (I left the skins on but feel free to peel them if you’d like). Place apples into a large saucepan; add apple juice and spices, down to and including vanilla extract. Bring to a boil then reduce heat to medium-low and cook for 1 hour until pears and apples are soft and mixture has thickened. 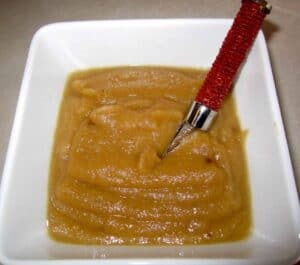 Remove from heat and puree using an immersion blender or food processor. Stir in maple syrup and butter. Previous Post: « Facts are Facts- except when they’re not. This looks so good and yummy for fall. How long will the butter store? It should last for about 2 weeks, I wouldn’t go longer than that. I made grilled cheeses with it for lunch with brie cheese and it was really good.